Now that all of our friends and family have (hopefully!) received Lolas birth announcement in the mail, I couldn't not show them off on here. 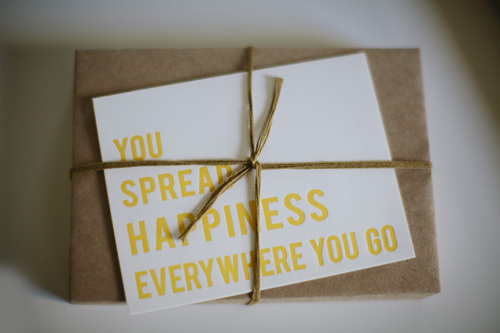 They were designed and printed by Cotton Flower Press (my new favorite letterpress studio based out of Portland!) and I really, truly fell in love with them. I was ecstatic when Mackenzie got in touch with me about making them, partly because everything she creates is pure magic, and the other part being that she is an absolute breeze to work with. She must've known I was still kind of in survival mode when she contacted me, because she honestly made it so easy for me. She led the way and offered just enough ideas and options until we came up with the perfect design. She sent me pictures of the entire letterpress process as she went along (which is fascinating in and of itself!) and they very quickly turned out even more beautiful than I expected. 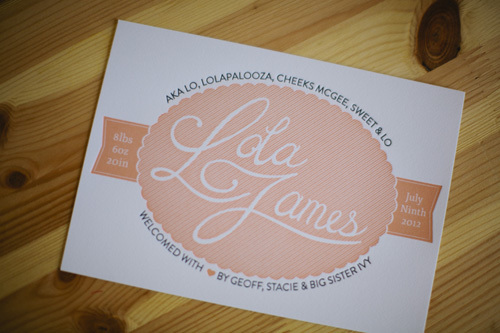 In the end, I loved the mix of girly and modern colors & fonts, the darling little scallop and stripe detail, and the personal touch of nicknames at the top (we're big on nicknames). Thank you, thank you, Cotton Flower Press-- I am so impressed with you guys, and we will definitely treasure this sweet little card forever. Of course they were mailed to me in the cutest packaging with this sweet little card attached on top (and you can bet I'm framing it for one of the girls rooms!). Check out Cotton Flowers Etsy shop or site for prints, stationary, custom invites or announcements, and more. These were darling!!!!! I opened ours yesterday, it made us all smile to see that cute Lola! Miss you langs! They are amazing! well done. I'll be bookmarking their site for when I (hopefully) need them!